Vista Las Palmas in Palm Springs, CA. Vista Las Palmas, once known as the “Beverly Hills” of Palm Springs, is a prestigious historic neighborhood nestled in at the base of the scenic San Jacinto Mountains, within walking distance of downtown. Built in the late 1950’s, many of these homes were constructed by the Alexander Construction Company, tract home builders already known for their Southern California Modern style of architecture. Their designs were forward-looking, with soaring roof lines, elegant minimalist facades, post and beam construction, walls of glass and spacious floor plans that transitioned smoothly from inside to out. Approximately 330 homes were designed for Vista Las Palmas by various architects, including William Krisel, who contributed his iconic “butterfly” roof houses and a folded plate roof design. Another architect, Charles Dubois, created the distinctive “Swiss Miss” A-frame style of home. This mix of designs creates one of the most varied, yet cohesive neighborhoods in Palm Springs. In the 1950’s, many Hollywood celebrities escaped from their busy work schedules to come play at their desert home retreats. Those who had homes in Vista Las Palmas were Marilyn Monroe, Dean Martin, Peter Lawford, Debbie Reynolds, Joan Collins, George Hamilton, Kirk Douglas and Dinah Shore. The relaxed desert lifestyle appeals to many buyers today and has caused a resurgence of popularity in these homes which were built to capture the lifestyle Southern California is known for. 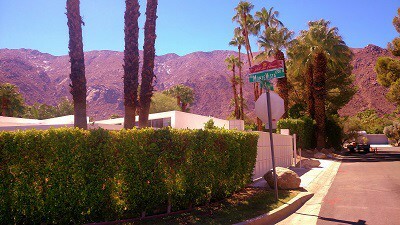 Being within walking distance of downtown Palm Springs affords the residents of Vista Las Palmas many special advantages. Fine dining, live entertainment, boutique shopping, art galleries and the Palm Springs Art Museum are mere blocks away. The Palm Springs International Airport and Interstate 10 area a quick and easy 20 minute drive away. Today, Vista Las Palmas has become a symbol of Mid-Century Modern design, which is enjoying a resurgence! Of the approximately 375 homes within this iconic community, most are Mid-Century Modern, though a mix of Spanish and ranch-style homes are sprinkled throughout the community. Many of the homes have been renovated or restored back to their original state. Owners include weekenders from nearby Los Angeles, part-time residents from colder climes and full-time residents who share an interest in preserving the history and architecture that make this neighborhood so special. People who like Vista Las Palmas also tend to enjoy Southridge, Old Las Palmas, The Mesa, and Andreas Hills.